As with any artistic look or movement, it’s hard to define the single moment it came to fruition, as trends naturally develop with time. However, Augustus Pugin (architect), John Ruskin (writer) and William Morris (designer) are strongly credited as the developing influences for 20 years on the movement’s underlying principles. As for the name, it’s commonly thought that T.J. Cobden Sanderson (artist, bookmaker and binder) first used the term whilst at a meeting of the Arts & Crafts Exhibition Society. The movement was prolific – inspiring everything from furniture, including fireplaces and settles to sit on either side of them, through to fabrics, decorative art, stained glass and tableware. It’s easy to spot Arts & Crafts designs – look for simple forms, flow of movement and patterns inspired by flora and fauna or heart motifs. 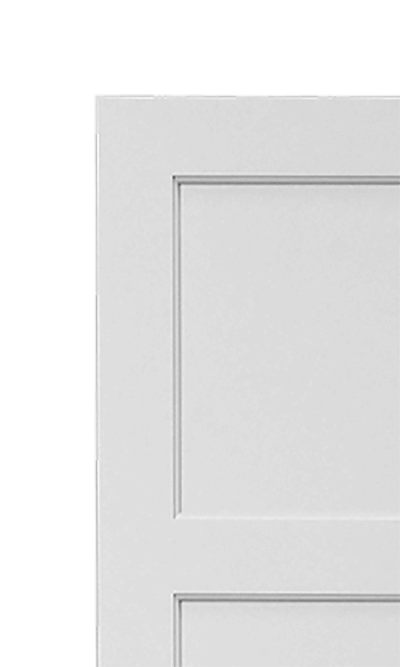 One of our most popular designs, this arts and crafts door has a simple, repeating square motif that echoes the style so beloved by Arts & Crafts designers. Quintessentially English, they lend a cosy, homely feel to any style of room. Available in a variety of heights and widths, they’re delivered made-to-measure and ready for you to paint in your chosen colour. It’s a wonderful way to introduce this style into your home or to complement existing pieces of furniture or ornaments that you may already own.